Make your Dispatch Center an information pipeline, on which first responders can rely for the relevant, real-time intelligence they need. The Project 25 (P25) standard-based MCC 7500 IP Dispatch Console enables effective, secure communication on your ASTRO 25 system to keep responders connected and informed when it matters most. The MCC 7500 console offers dispatchers integration capabilities to reach across multiple applications and resources for enhanced response coordination. A highly intuitive interface increases ease of use for organizing resources, coordinating a response and communicating valuable information. Inherent reliability and security of your ASTRO 25 system ensures dispatchers stay connected to those in the field with best-in-class audio quality. And flexible servicing and installation on a software-based platform makes deployment affordable. Effectively coordinate a response with high quality voice and tone communication over your ASTRO 25 trunked and conventional systems. When voice is not an option send critical incident information via Talkgroup Text Message to make sure those in the field are always informed. 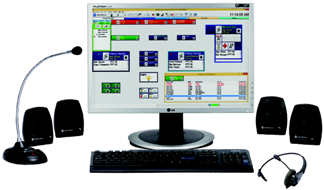 Based on a modernized, intuitive approach to the legacy Gold Elite graphical user interface (GUI), the MCC 7500 console GUI minimizes training time and is easily adoptable by new and veteran dispatchers alike. Purposed-design workflows, critical resource information displays and contextual right-click menus make operation feel natural and increase efficiency. The MCC 7500 console conforms to your organization’s operations. Maintain the look and functionality that you have become accustomed to with flexible window sizing and placement, resource coloring and customizable icons. A single critical operational detail has the potential to change the trajectory of your response within a single moment. To never miss a detail, rely on our smart voice prioritization and intelligent audio routing capabilities at your dispatch positions. The success of your operations relies on the communication of often-times sensitive information. End-to-end encryption protects information in transit and agency partitioning goes a step further to help maintain autonomy of communications within a single system. Furthermore, reliability features like link and resource polling, coupled with the inherent reliability of your ASTRO 25 system, ensures that critical information can always be communicated to the field. To ease your console transition, the MCC 7500 console can interoperate with legacy ASTRO 25 console systems for an incremental deployment. Flexible installation of the Voice Processing Module (VPM) eases maintenance and minimizes your physical footprint for added cost-savings. As a primarily software-based solution, feature and release updates are all capable from a centralized, single point of contact.